Love the lips you were born with. Being the most beautiful you begins and ends with simplicity. Here are some tips to enhance the natural beauty of your lips. I don't know about you, but I always have a lip balm in my pocket. I am constantly moisturizing my lips. I use to think I had some strange issue with my lips, being that they often felt too dry to me. But did you know that lips don't have sweat glands or the ability to produce oils? Therefore, without sweat glands or sebaceous glands (oil producing glands), your lips are prone to excessive dryness. Hallelujah, it's not just me! These vulnerabilities make it even more important that we protect this delicate skin. Lips are made of a much thinner skin than the rest of the body, which also makes them more susceptible to damage from the sun's UV rays. And since they are continually exposed to the outside world, 24 hours a day, we need to give them extra loving care. A woman's lips are also a visible expression of her fertility. In studies performed on the science of human attraction, psychologists have concluded that a woman's facial and sexual attractiveness is closely linked to the makeup of her hormones during puberty and development. 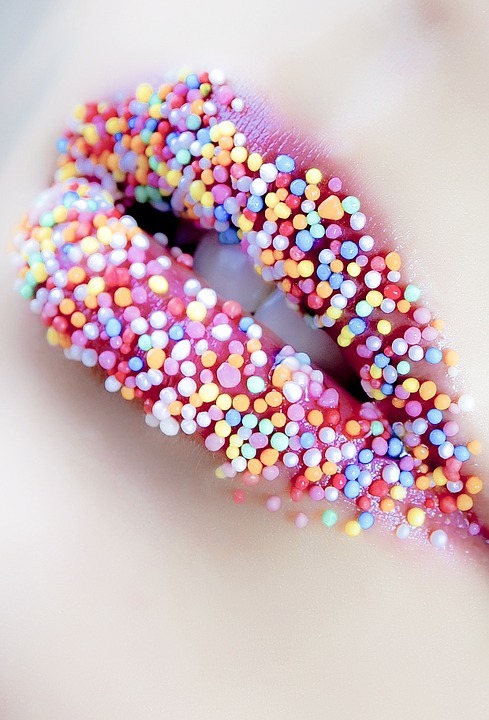 It is as important to exfoliate your lips as it is for your face and body. By not removing the layers of dead cells regularly, you leave your lips vulnerable to chapping, cracking, and peeling. Scrubbing away those dead cells regularly, you allow the production of new collagen to be formed, which is the natural protein that allows the skin (and lips) to maintain their soft, supple texture. Exfoliating your lips doesn't have to cost you any extra money. Below are a few things from around the house that you can use to keep those lips of yours beautiful. How often you exfoliate is completely up to you. There are no set standards you have to adhere too. Personally, I gently exfoliate my lips daily when I wash and exfoliate my face, using nothing more than a face cloth. But every other day or every few days is perfectly acceptable. I also do varying degrees of exfoliating. Each weekend or every other weekend (depending on my schedule), I like to have one day or at least an afternoon that I call my beauty day. This is the day I do all of my little extras, nails, deep exfoliating, deep conditioning my hair, and so forth. On a regular day, I simply use a warmly damp, standard (rough surfaced) face cloth and use it to exfoliate my face and then gently rub it in circles then back and forth over my lips. Not too hard, just enough to where I can feel and see the fresh skin shine through. For my beauty days, I go beyond the face cloth. Below is a small list of regular, everyday kitchen products I like to use. You can make a fancy scrub with these if you prefer. However, I get great results from just dipping a damp fingertip or toothbrush in the product and carefully scrubbing my lips. Note: Any of these can be used alone or even paired up with a dab of coconut oil. Used Caffeinated Coffee Grounds -Before you throw out your coffee grounds, think about re-using them to exfoliate your face and lips. Caffeine is loaded with antioxidants which help fight against sun damage as well as free radicals, making it a wonderful anti-aging beauty tool. Sugar or Brown Sugar -You can use these by themselves or add a touch of honey (for the anti-bacterial properties) and a touch of olive or grapeseed oil (for the moisturizing properties). According to skincare.lovetoknow.com, "Sugar is also full of glycolic acid, an alpha-hydroxy acid that is crucial for maintaining healthy skin and is usually a key ingredient in pricey products." Baking Soda -According to top10homeremedies.com, "It is a good exfoliating agent that helps remove dead cells. In addition, it balances pH level of the skin, which is very important to maintain even and clear skin.". Sea Salt -Packed with wonderful minerals such as magnesium, zinc, potassium, and calcium, you can't go wrong by adding this ingredient into your weekly beauty routine. TOP 10 LIP HACKS! HOW TO GET BIGGER LIPS NATURALLY! There's nothing more important after you have done all that work to keep your lips looking their best than to keep them moisturized. While lipstick can protect your lips from the elements and the UV rays of the sun, I prefer to use lip balm daily. Right now my favorite balm to keep close-by is Maybelline New York Baby Lips Crystal Lip Balm, Pink Quartz. I always have one here at my desk and one in my purse (for when I am away from the house). This stuff keeps my lips feeling great. What I like best about it is that it doesn't just moisturize with its buttery smoothness, it also adds a shimmery pinkish tint to my lips (that you can build upon if you so choose). I spent decades wearing lipstick (almost every day). Now that I'm older, I enjoy the more playful, youthful feel and look of lip balm to lipstick. I never have to be concerned with smudging my lipstick or getting it on anything. With my lip balm, I can just pull it out of my pocket or purse, swipe and go without having to check myself in a mirror. There is a lot of freedom that goes with using lip balm, and I've grown quite fond of it. Truth be told (coming from someone who wore lipstick almost every day for over 20 years), lipstick can never moisturize your lips like a good, quality lip balm. However, if lipstick is your product of choice, I suggest applying a soft, clear balm to your fresh lips before you apply your lipstick. The choice is yours! As long as you exfoliate and moisturize regularly, you will sustain beautiful, youthful looking lips, long into your old age. So be sure to take care of those babies!